“Music of Virtual Worlds” concert with Emmanuel Lagumbay conducting LVSO combined with The Summoners Orchestra and the Mt SAC Choir! Rehearsals for the La Verne Symphony Orchestra are in full swing! We’re gearing up for our 5th Anniversary season and are currently inviting new members to join. If you are a musician looking to join an exciting, dynamic ensemble, please consider joining us! You can email me, the orchestra director, at drdanieller8@gmail.com. You can also visit our Facebook page for more info: Facebook.com/lvsymphonyorchestra. Special note for new and returning LVSO musicians: Rehearsals for the fall 2016 season begin on the first Thursday, Sept. 1, from 7:00 – 9:00 pm in Morgan Auditorium at the University of La Verne. For more information, please email Dr. Danielle Rosaria at drdanieller8@gmail.com. We welcome new musicians, and if you play an instrument, we’re inviting you! We have two seasons, fall and spring. Each starts at the beginning of the new ULV semester. We perform at least twice a year at the end of each season. 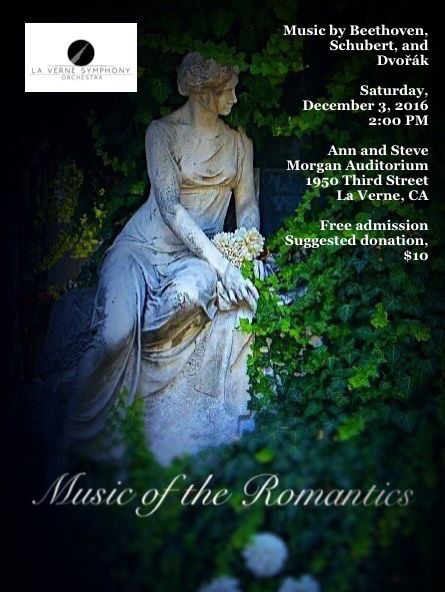 Performances take place in the Ann and Steve Morgan Auditorium at the University of La Verne. We perform classical and contemporary music as well as works by living composers. Upcoming concerts are posted on this page. We use 100% of funds donated to us for orchestra costs such as music scores and parts, printing, pencils and folders, and marketing outreach materials as well as masterclasses and special performances. You can also donate online at giveto.laverne.edu and choose CAS, then Orchestra. To donate by phone, you can call ULV Gift Processing at (909) 448 – 4682. LVSO is comprised of university students and people from the surrounding community. We are welcoming any musician, beginning, intermediate, and advanced levels, high school age or older. We cultivate dedication, focus, and a true knowledge of what it means to play music in an orchestra, with an emphasis on a firm foundation in music reading, rhythm, ensemble cohesiveness, and stylistic interpretation. 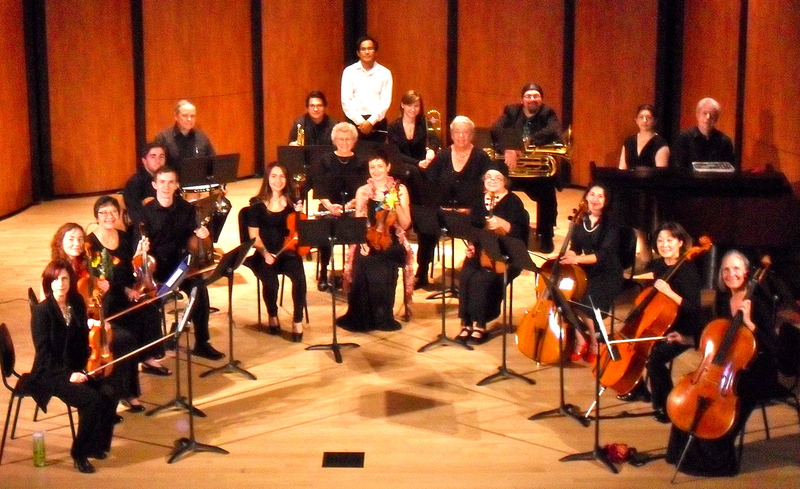 LVSO is an inter-generational ensemble with a 60+ year age range of our members. We pride ourselves on providing an environment for people of diverse backgrounds and ages to collaborate together and learn from each other. We are a cultural center for the community with composers, working and retired college professors, professional, student, and recreational musicians all participating in the orchestra. This rich fabric of diversity enriches the lives of our members and of our audiences. Musicians are encouraged to contribute input and to actively participate in the musical life of the orchestra. LVSO is also a University of La Verne class. ULV students can and are encouraged to register for it to receive arts and ensemble credits. The class is MUS 119, “Symphony Orchestra”. 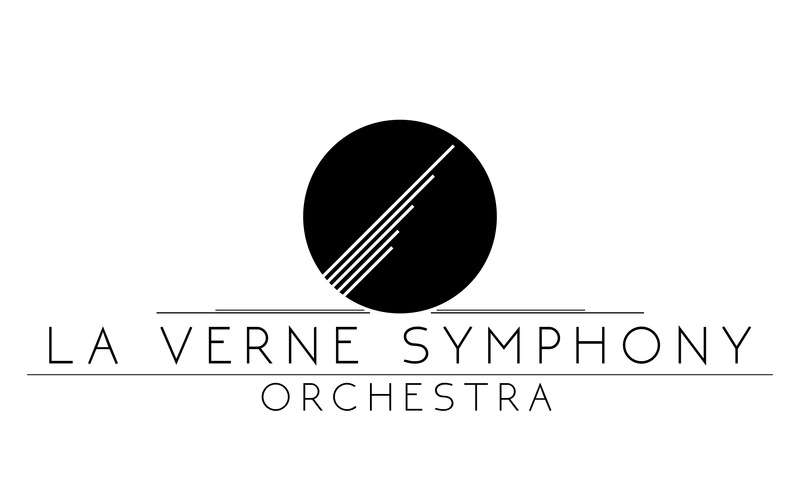 The orchestra meets weekly during the school year on Thursday nights from 7:00 – 9:00 in the beautiful Ann and Steve Morgan Auditorium at the University of La Verne, 1950 Third Street, La Verne, California 91750. Working in the La Verne Symphony Orchestra, we encounter all of these on a regular basis. Requirements: We welcome all orchestral instruments including strings, brass, woodwinds, and percussion. We also welcome intermediate to advanced pianists who are interested in collaborating with members of the orchestra to study chamber music. Sometimes musicians need to purchase a few music books. Additional music is given out at rehearsals. Auditions for new members are held every fall and spring or by appointment. If you are interested in joining, please contact me, Dr. Danielle Rosaria, at drdanieller8@gmail.com or at (909) 240-6416. LVSO offers chamber music opportunities for those who want to collaborate together in smaller ensembles. The Lordsburg Chamber Ensemble is one of the groups which performs regularly at LVSO concerts. 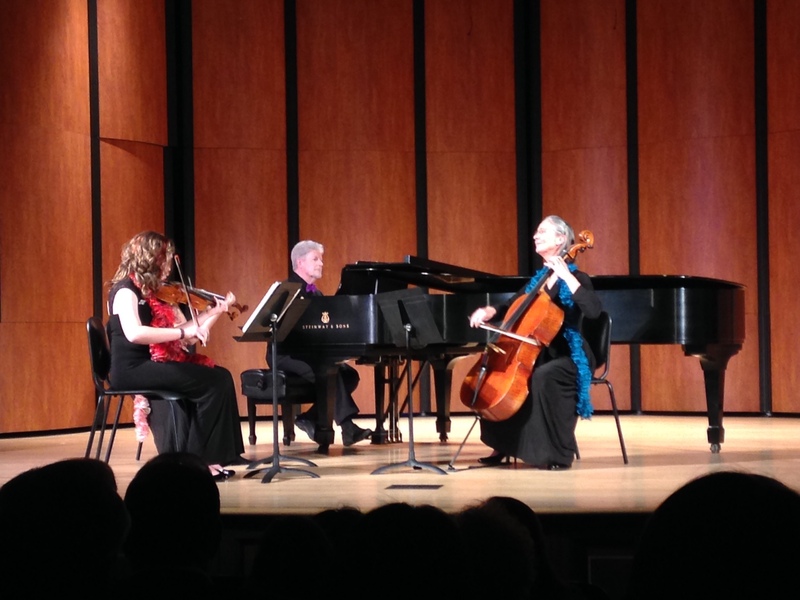 From left to right: Pia Spors (violin 1), Danielle Rosaria (violin 2), Don Linde (piano), and Catherine Bacus (cello). 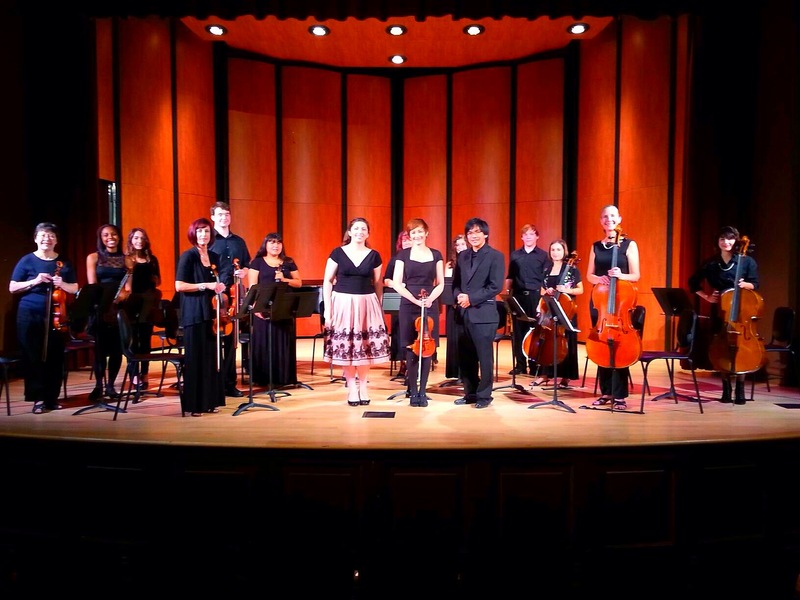 LVSO started out as the La Verne String Ensemble, then grew into the La Verne Chamber Orchestra (LVCO) in the fall of 2013. Here is LVCO after our spring, 2014 concert. Many of these original members are still with the orchestra today! LVSO has been growing steadily since its beginnings. Here is LVSO following our 2014 Fall Concert. Note from the Director: Our winter concert 2015 “Music from America” was a great success! We performed Aaron Copland’s “Fanfare for the Common Man”, “Variations on a Shaker Melody”, James Horner’s “Music from Apollo 13” and also premiered the original composition “Symphonic Picture No. 2: The American West” which I composed for LVSO and had the privilege of conducting. My many thanks go our to all the LVSO musicians, the ULV Music Department and all those who made this dream come true! Get to know the orchestra! Here is a bit of information about some of our members. It’s the wonderful people in LVSO that make our orchestra so great! Deanna Rae is a local bronze sculpture artist and also a cellist in the La Verne Symphony Orchestra. On her website, http://www.theraecollection.com, you can see her work as well as videos about the process of creating an original bronze sculpture. She is also a member of the Celloteers, an all cello chamber ensemble that performs with LVSO. The University of La Verne has some great musicians! This was the first concert where we all came together to perform in one piece pf music. 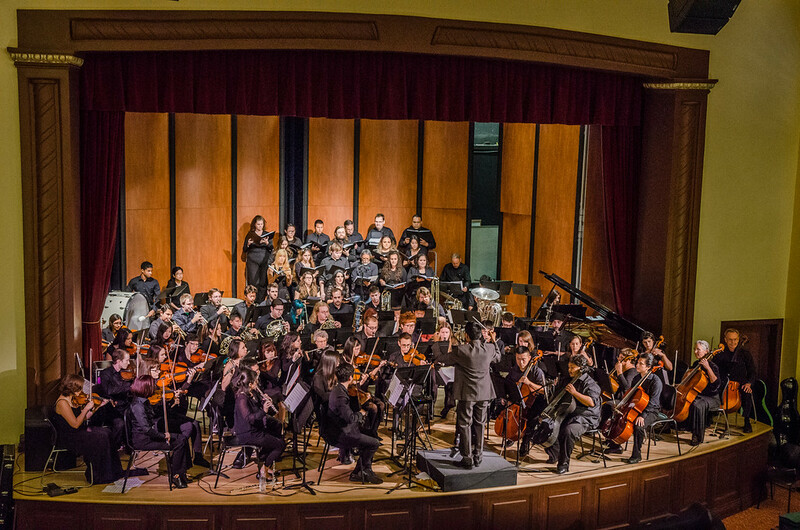 Emmanuel Lagumbay, the conductor of the La Verne Symphony Orchestra, composed a piece that incorporated ULV choral groups, the ULV Pep Band, the West African Drum Ensemble, and the La Verne Symphony Orchestra. We had one afternoon to put all the ensembles together and then give the concert. It was an amazing day and we had an outstanding audience. Thank you and congratulations to everyone who participated! Here’s the video of the performance. With this and future ULV performances we hope to raise awareness about the great musical opportunities at ULV. 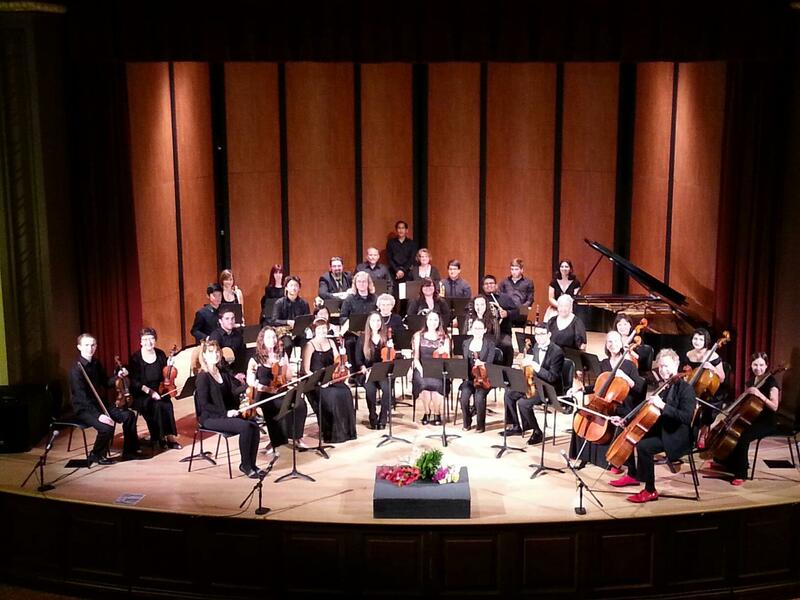 This concert took place on April 19, 2015 in the Ann and Steve Morgan Auditorium at the University of La Verne. LVSO Spring Concert, “Music from the Movies”, featuring movie scores and classical music that has appeared in movies, this concert is the culmination of our LVSO spring season. 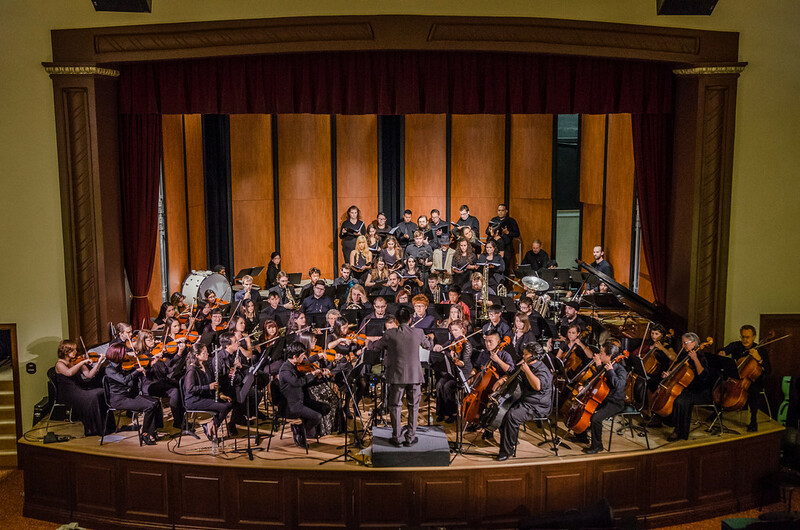 Here is the quote and photo from ULV Campus Times: The music department and the La Verne Symphony Orchestra presented “Music of the Movies” Saturday at Morgan Auditorium. Conductor Emmanuel Lagumbay led the orchestra in songs from “The Hobbit,” “Willy Wonka and the Chocolate Factory” and “Pirates of the Caribbean.” The orchestra is made up of students enrolled in MUS 119 taught by Danielle Rosaria Nahas. 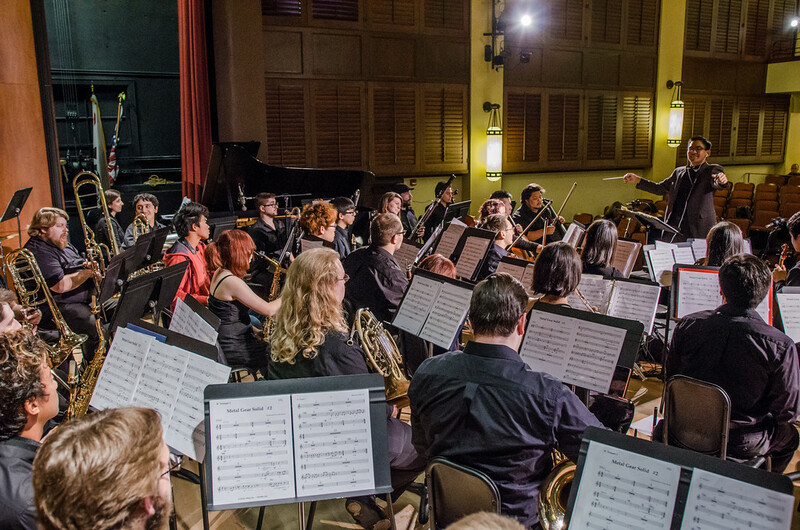 LVSO is comprised of university students and musicians from the surrounding community. It’s a great group of people with a noble aim for a community.